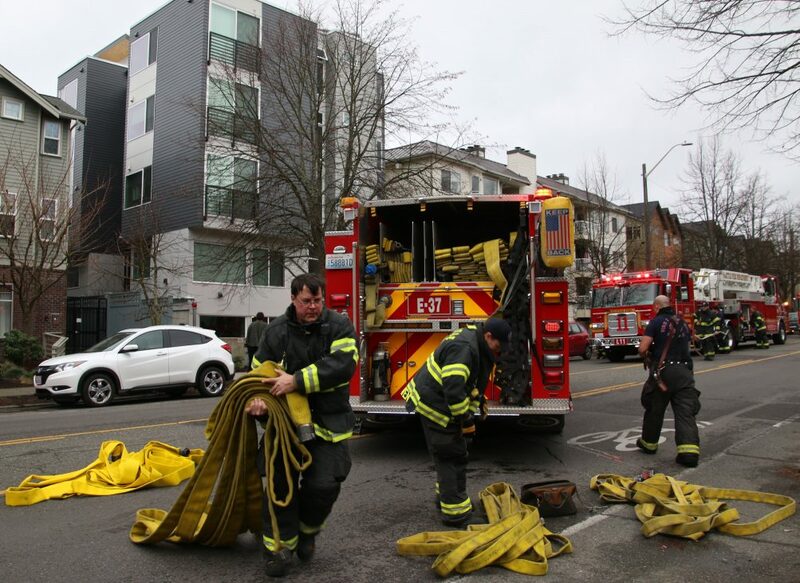 When a Seattle Fire Department “full response” was sent at midmorning Friday to 5949 California SW – the 2-year-old microstudio apartment building known as Fauntleroy Lofts – it was the eighth time SFD had been called there in the past five days. And while today’s “full response” was for a kitchen fire, some of the other incidents have led to an arson investigation. Archived Real-Time 911 logs show two calls there on Monday (February 11th), an Automatic Fire Alarm call at 2:56 pm and a 3 Red call at 4:40 pm. There were three on Thursday (February 15th), Automatic Fire Alarm calls at 2:57 pm and 4:39 pm and a 1 Red call at 5:44 pm. Today there were three more – an Automatic Fire Alarm call at 7:04 am, the “full response” at 10:25 am, and an Automatic Fire Alarm at 12:22 pm. Before that, online records show, there hadn’t been an SFD dispatch to 5949 California SW since a fire-alarm call on January 10th. We are writing you in response to an ongoing arson investigation at our building Fauntleroy Lofts. We take this all EXTREMELY serious, as the safety of our tenants has been grossly violated. We are working directly with both the Seattle Fire Dept. Arson Investigation Team and The Seattle Police Dept. to catch the person responsible for setting the fires and false alarms. Although we cannot discuss details of the investigation, we are working to locate and prosecute this criminal to the fullest extent of the law. As owners, the safety of the both people living in our building and the surrounding community is our highest concern. Perception may be that nothing is being done, but please be assured we are doing everything we physically & legally can to provide our tenants with the safety and security they deserve. Although this may make it appear “nothing is being done”, our biggest priority is following protocol with the Arson investigation team so we can put an end to this so our building is safe again. ANY suspicious activity should be reported IMMEDIATELY to the Arson Investigation Team @ 1-800-55-ARSON or the Seattle Police Dept. Arson/Bomb Unit @ 206-684-8980. According to King County Assessor records, the building has 38 units. 20 Replies to "FOLLOWUP: Arson investigation after eight SFD calls in five days at Fauntleroy Lofts"
We feel as if the property isn’t doing anything because they avoid us during these incidents. They don’t address our concerns to put cameras up and are never available to reach when these incidents happen. As tenants we’ve had to take these matters into our own hands, which isn’t right. Myself and several other tenants have left the property temporarily due to the safety concerns, yet the property is ok with allowing tentants to live there under these conditions with a possible arsonist under the same roof. I don’t see how the property or SPD/SFD is okay with people living there under the current circumstances! I get you need to make sure you have the details before you act but it seem rather clear. What evidence are they waiting for!? Tangent question, is the other apartment around the corner that was set on fire in summer still under investigation? Is that why nothing has been done to fix the burnt exterior of it? “apodments” until the arsonist is caught? Nothing “hidden” – this is how the note was signed. Owners of all properties, as you know, are listed in county records. This one’s owned by an LLC. Its members can be looked up in the state corporations database. On top of this, the owners are tax exempt. Sweet deal. Tax exempt because they provide low income housing? Why are they tax exempt? MFTE exempts owners from property tax *on the residential units* for a certain period of time. They still have to pay tax on the land and (not applicable here) any commercial part of the property. Much has changed in the ensuing 4-plus years. Jim Potter died in 2014. Microhousing was regulated, as noted upthread. And wow, look at those rents. Yup, monitoring the call. They’ve already canceled one of the two dispatched SFD units. … (added) and at 9:35, the other unit has been canceled too. Sounds like a nightmare for the residents…seems odd that nobody can figure out who is doing this with the fairly small amount of people living there . hope they get this person and prosecute aggressively.